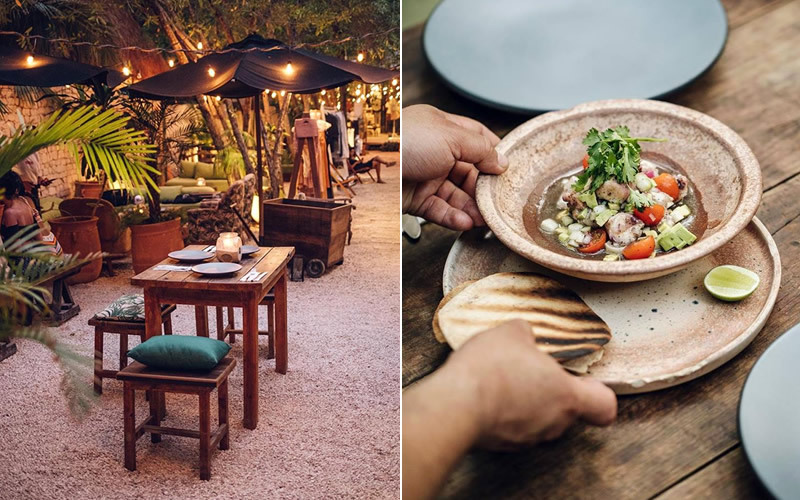 If you’re lucky enough to find yourself in Tulum, you’ll find the sandy beaches and turquoise sea form the perfect backdrop for enjoying Mexico’s culinary delights. 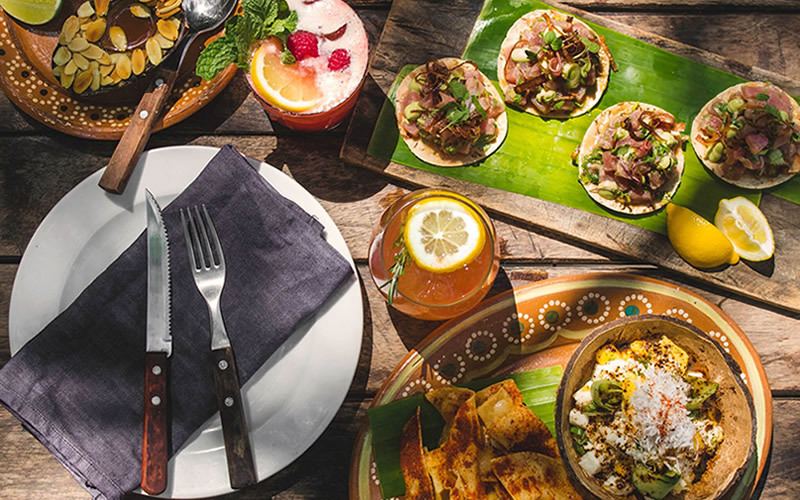 Here are some of our top picks for foodies in Tulum – there’s something for everyone! Gitano is a must-visit for its stunning location perched in the lush jungle bordering Tulum beach. It offers modern Mexican dishes cooked in a wood-burning oven and open grill. Another highlight is their cocktails, which are inspired by 1940s tropical Tiki bars. Mezcal is their speciality – there are over 50 to choose from. If you’re into beach clubs, look no further than this three-story clubhouse situated on one of the most beautiful white sandy beaches you’ve ever seen. Head chef Federico Cappi uses the freshest ingredients the area has to offer to create dishes influenced by the flavours of Latin America and the Mediterranean. We recommend taking a seat at the beach bar next to the restaurant to absorb the holiday vibes and enjoy a drink before dinner. Looking to treat yourself? Then NÜ should definitely be on your list. The restaurant is run by Cesar Castañeda, who was elected as one of Mexico’s 10 best Chefs under 30 by Gourmet Magazine. He and his team of seven sous-chefs are truly dedicated to their work – they even got matching tattoos to symbolise the spiritual bond between them. This tattoo then turned into the restaurant’s official logo and serves as a daily reminder to serve only the best modern Mexican food. Fancy a glamourous night out paired with good food? Taboo is the town’s hottest beach club serving flavourful Mediterranean cuisine. It also features a fantastic shisha bar and a resident DJ playing the best Mexican beats right at the beach. What are you waiting for? Party the night away at Taboo! Sustainability and protection of the environment are the focus at Mur Mur. The restaurant strives to create authentic Mexican cuisine using locally sourced ingredients from the Yucatan peninsula. The team go back to basics when it comes to preparing them, too – they use the least amount of technology required for their cooking. The dishes will transport you to food heaven, especially if you’re a fan of seafood. Hartwood restaurant has been called ‘the place I dream about’ by Noma’s head chef Rene Redzepi, and it’s easy to see why. 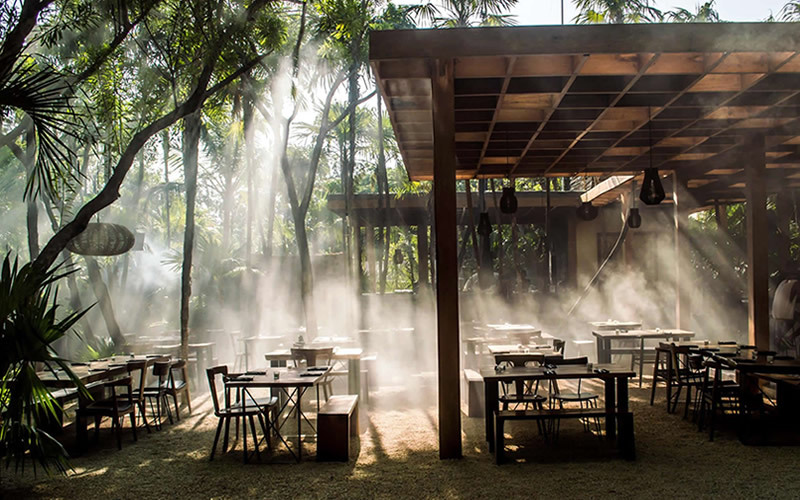 The restaurant, founded by New York chef Eric Werner and his wife Mya Henry, stuns visitors with its picture-perfect beach location and colourful Mexican dishes. The team travel to the Yucatan markets and farms to collect the freshest local ingredients for their daily-changing menu. Guests can watch their dishes being cooked in the hand-made wood-burning oven and grill. A true feast for all the senses. Atmospheric cooking lies at the core of ARCA. Open-fire cooking dominates the menu and guests will be amazed by the spectacular flavours inspired by Tulum’s flora and fauna. 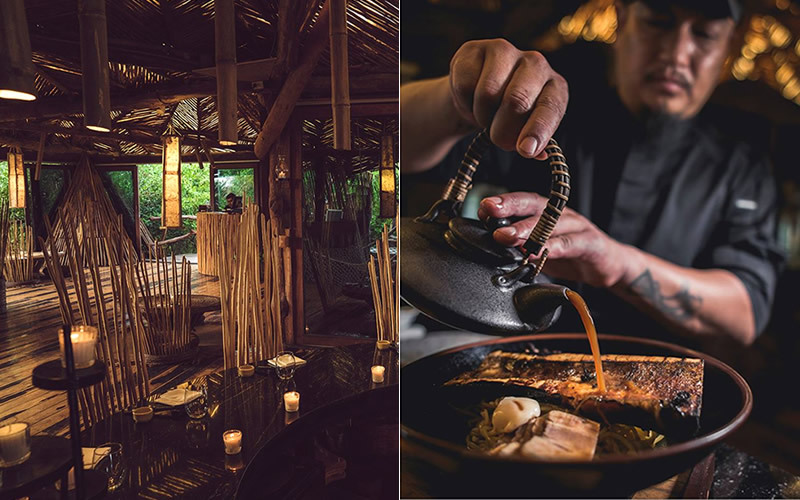 Book a table at this jungle restaurant and tuck into their speciality: grilled octopus al pastor. If that’s not floating your boat, there’s always the catch of the day to choose from, too. Have you ever dreamt of dining in a treehouse-style restaurant overlooking the Mayan jungle? It’s possible at Kin Toh, which serves Mayan-Mexican fusion cuisine. Kin Toh’s dishes read like something from a novel. Fancy ‘where the coconut life begins’ (lionfish ceviche) or “food of the gods” (deer tartare)? It’s worth arriving early for dinner so you can enjoy a drink while watching the sunset. Tseen-Ja specialises in Japanese-Mexican fusion cuisine, using traditional Japanese techniques and combining them with Mexican ingredients. The restaurant features traditional Japanese-style floor-level seating overlooking the Caribbean Sea. To enter the restaurant, you will have to walk across a bridge over the Mayan jungle. If you are looking for a truly special dining experience, Tseen-Ja ticks all the boxes. Rosa Negra offers culinary delights from South American countries like Peru, Argentina, Colombia and Brazil, as well as Mexico. The true highlight, however, is their famous Japanese Wagyu & Kobe beef – Rosa Negra is a proud member of the Kobe beef federation. It’s a must-visit for any steak lover. 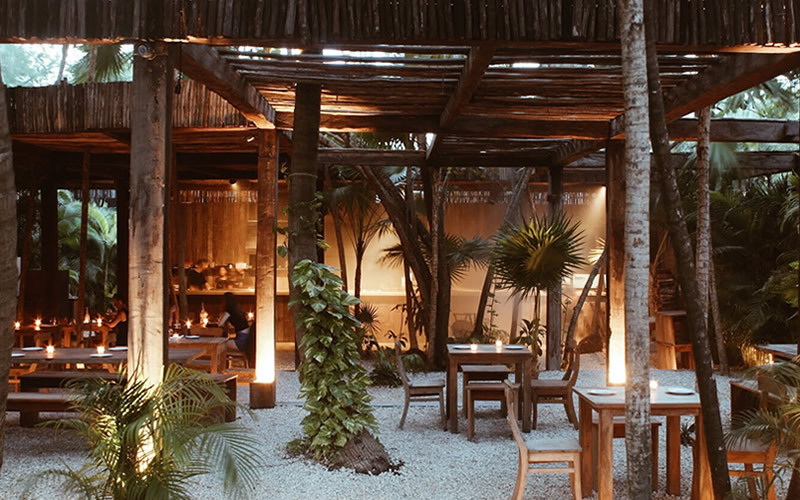 Visit OpenTable to discover more restaurants in Tulum.